Keppapilavu residents protest opposite the Mullaitivu Security Force Headquarters. 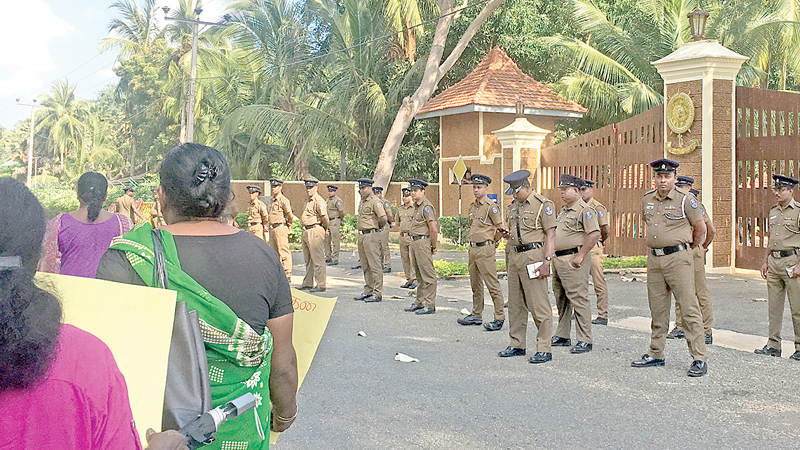 Keppapilavu residents began protesting opposite the Mullaitivu Security Force Headquarters (SFHQ-MLT) on Sunday, January 27, demanding that the military return the land which belongs to them. Villagers of Keppapilavu have been protesting for around two years demanding their land back, backed by certain Colombo-based NGOs. Based on a pledge made by President Maithripala Sirisena to return all military-held lands to their rightful owners by December 31, 2018, the Keppapilavu residents, who protested earlier, had been assured of a solution by January 25. They threatened to forcibly enter their lands if the government failed to release their lands by then. Accordingly, last Sunday the villagers had decided to walk towards the camp and force their way in. However, the Police had placed barricades around the camp preventing the villagers from obstructing the SFHQ gates. However, the number of protestors were relatively small, but were supported by several others who had been brought there by a certain NGO. The question here is that while 62,000 Sri Lankans are still languishing in around 107 refugee camps in Tamil Nadu and another 38,000 are living with relatives and friends in India, why is there so much attention, both locally and internationally, being given to the Keppapilavu issue? In fact, based on appeals made by Members of Parliament (MPs) and local politicians in the Mullaitivu district, the SFHQ-MLT released 189 acres of land situated in the SFHQ-MLT Army Cantonment premises on July 19, 2017. The release of the 189 acres at Keppapilavu was intimated officially to the Maritimepattu Divisional Secretary in the presence of Mrs. R. Ketheeswaran, District Secretary for Mullaitivu by Brigadier General Staff, SFHQ-MLT. Under this programme, families who were living with their next of kin were able to return to their original places of residence in Keppapilavu. A similar release of 243 acres belonging to civilians in Keppapilavu, used by the Security Forces in Mullaitivu, took place earlier on January 25, 2017, in response to the humanitarian concerns of displaced Mullaitivu people. Shortly after that, the SFHQ-MLT released lands and properties in Keppapilavu and Seeniyamottai areas. Further, on January 1, the Mullaitivu SFHQ opened the public road that runs across the perimeter of the SFHQ-MLT connecting Puthukudiyirippu and Vattappalai. Northern Province Governor Suren Raghavan said he had spoken to MP Shanthi Sriskandarajah, who is a victim of war herself, that she should take the leadership in initiating a dialogue. “I have offered to meet them on January 31 with MP Sriskandarajah and three other representatives of the group, the Mullaitivu Commander Maj. Gen. Rajaguru, and officials from the Defence Ministry. I have always told them to come to the discussion with their best demand and also their second-best demand to reach a timely and lasting solution. It’s been two years and for some unknown reason, this issue has gained international attention. There are more pressing issues affecting the nation and the people on the whole, compared to the 56 families in Keppapilavu to whom we have already provided alternative options. But they don’t agree and have a ‘one demand’ policy. They do have the right to do so, there is no denying that, but I ask that they be kind to the people who are trying to help them,” he said. “There are so many issues that need my attention in the Northern Province and if I am going to spend all my time on only 56 families, then what about the thousands of others who are languishing in IDP camps? Don’t they deserve the same or more attention? Just because some of the NGOs in Colombo have not taken these issues as a serious matter for their own civil engagements, do all these other people become nobodies? Therefore, let’s be rational. I am giving my priority to these people and I expect them to be rational,” the Governor said. The Daily News also met with some of the residents from Keppapilavu who were demanding the release of the military-held lands. They said that their school, Montessori and all areas they require, including the burial grounds, are within the lands under military occupation. “Only a few have houses and the others have to start rebuilding from scratch. Our schools, community centre, cemeteries and even the wells we take water from are all within the military-held lands. We are not against the Army being here, but we just want our lands back. There is land on the other side belonging to the Forest Department, so the government can move the Army camp to that area and have these private lands released to us,” said Suheenthan, a father of two. Speaking to the Daily News, the PARL Coordinator Marisa de Silva said that their network was supporting the Keppapilavu residents in their struggle to reclaim their lands. “As a direct result of the people’s march into Army-occupied lands on January 26, the people were asked to attend a meeting with the President and other relevant government stakeholders, including representatives from the military, the Tamil National Alliance (TNA) and the Northern Province Governor, on January 31. However, the President had not been in attendance. Yet another meeting has been scheduled for February 11 in Mullaitivu. We hope it won’t be yet another meeting without any result. These people have been displaced since 2008, and they want their lands back so they could restart their lives once more. These people have been engaged in a road-side protest for almost two years (more than 700 days), which is the longest continuous land protest in the country. Their basic demand is the release all their lands,” she added. The Police said they had obtained a court order preventing the protestors from blocking the road near the entrance to the Mullaitivu Security Force Headquarters, and had specified that the protestors could protest peacefully, maintaining a distance of 75 metres from the Mullaitivu SFHQ. Currently however, following the court having instructed the people to negotiate together with the lawyers and the police as to where they should protest, the protestors are currently situated within a privately owned released land situated across the road from the main entrance of the camp, close to where they marched to on January 26. Explaining their situation, one of the protestors, Ariyakala, who is referred to as “Teacher,” said there are 171 acres under the military which belong to 104 families. When asked if they all had deeds to prove ownership of these lands, she said four of them have Swarnabhoomi deeds, 56 have Kachcheri approval and the rest have permits. While much of the focus is on the Keppapilavu residents, another group of 83 refugees returned to Sri Lanka from Tamil Nadu last Thursday (31) through the process facilitated by the Colombo office of the United Nations High Commissioner for Refugees (UNHCR). So far 11,020 refugees have returned to the country from Tamil Nadu since 2009. 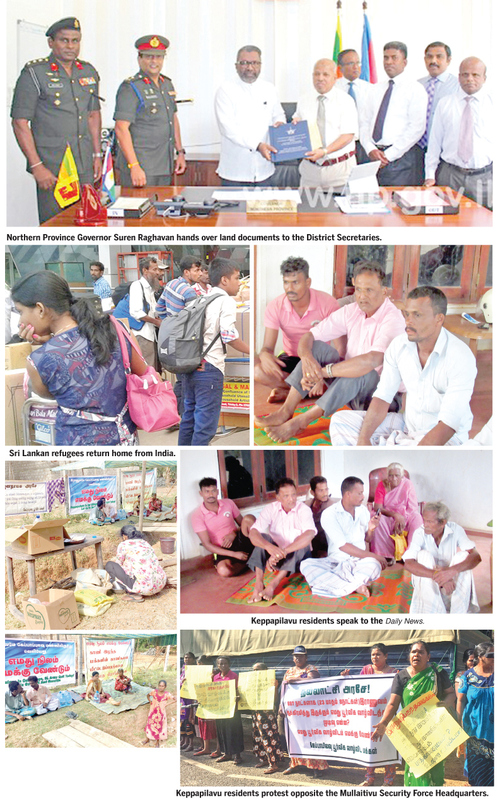 Those who returned to the country are from Vavuniya, Mannar, Matale, Mullaitivu, Trincomalee and Jaffna. The UNHCR had provided the returning IDPs free air tickets for their return and they would also be provided dry rations for six months, until they get their lives back on track, and also a livelihood allowance of not more than Rs. 100,000. In addition, another 3,000 refugees are also expected to return home by next week. In some areas however, those who have already been given lands and resettled are not quite happy with the other refugees returning from India. They fear that once they are given lands and resettled, those already living in these areas would have lesser lands to cultivate on. Settling the land issues and resettlement of the displaced are not easy tasks for the government. But, in some instances, there definitely needs to be some form of compromise between the government and the people. As Northern Governor Raghavan insisted, all parties concerned need to come up with the best solution and the next-best solution in order to strike a compromise and resolve these disputes and get on with the greater task of resettling the thousands of refugees still in refugee camps in India and those living with relatives, who are eagerly looking forward to returning home.